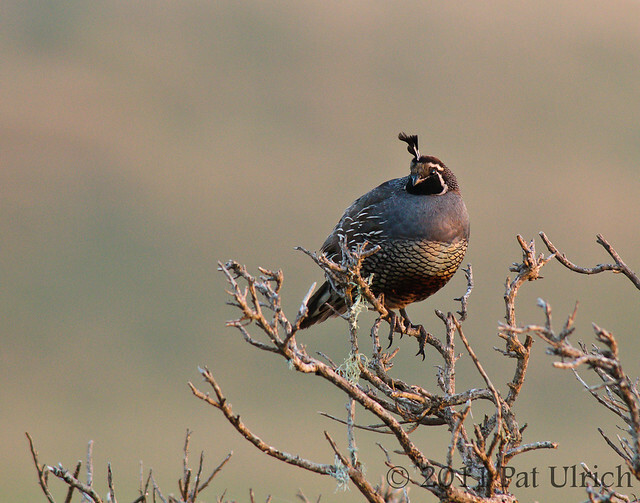 A male California quail is kissed by the golden light of sunset as he sits on the old gnarled branches of a coyote bush near Abbott's Lagoon in Point Reyes National Seashore. You must be up early in the morning or late evening to get light like this! I enjoy seeing all your wildlife photographs, they are so beautiful. Great photo Pat. Excellent composition, color and background. I like the warm, soft light and perch here Pat.